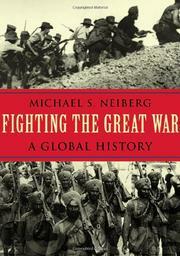 A searching study of the war to end all wars. World War I was inevitable, given the complex rivalries that existed among England, France, Russia, Germany, Austria-Hungary, and the other players in the struggle. But, writes Neiberg (History/US Air Force Academy), it was not inevitable just because an unfortunate Austro-Hungarian nobleman was assassinated: “The archduke’s political views were unpopular in the Viennese court, and the royals of Europe had often snubbed Franz Ferdinand because he had married a woman of inferior social status.” It took months after the assassination for the Allied and Central Powers to decide that the time was right for bloodletting. Many another poor assumption and bad decision followed. The Germans discounted the British army, even though it was probably the best-trained and most effective in Europe at the time; the German army, further, settled on a policy of Schrecklichkeit, or “frightfulness,” in Belgium, “a policy that had been approved by leaders of both the army and the government” but that succeeded largely in uniting the Allied citizenry against the savage Hun; the Russians relied on cavalry against machine guns, the French on forts against heavy artillery, the British on incompetent leaders, and so on, all at terrible cost. The rate of butchery was established early on, as Neiberg shows: in the first few weeks of the war, the French army lost 200,000 men and a full tenth of its officer corps “in an attempt to recover Alsace and Lorraine, only to discover that the real threat lay elsewhere.” And things were no better on the fringes of the war, in places like Bulgaria and Cameroon, where the fighting looked only a little more modern than the wars of the 18th century. Even the peace was confused, with “Bolshevism, authoritarianism, the beginnings of fascism, and fragile democracies” in the place of the old empires and dynasties. A very worthy addition to the historical literature, complementing Hew Strachan’s The First World War (2004), Robert Massie’s Castles of Steel (2003), and other recent studies of the war.